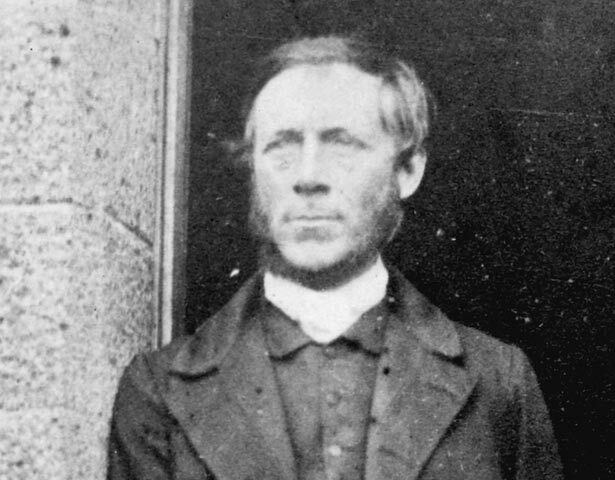 On 2 March 1865 Carl Sylvius Völkner, a German-born missionary, was hanged from a willow tree near his church at Ōpōtiki. Followers of a new religion, Pai Marire, who suspected Völkner of spying for the government, were held responsible. Sent to New Zealand in 1849 by the North German Missionary Society, Völkner began work in Taranaki alongside fellow German Protestant missionary Johann Riemenschneider. In 1852 he switched his allegiance to the Church Missionary Society (CMS) and became a lay teacher in lower Waikato. After marrying Emma Lanfear he was ordained deacon in 1860 and priest in 1861 before taking charge of the CMS mission station at Ōpōtiki in August 1861. Völkner was welcomed by Te Whakatōhea, who built a church and a school for the mission station. During the Taranaki and Waikato wars Te Whakatōhea remained largely peaceful. By 1864, however, there was increasing debate amongst East Coast tribes as to whether they should support the Waikato and Tauranga people. Early that year East Coast tribes (including Te Whakatōhea) were stopped by Te Arawa from travelling to Waikato through Rotorua. When they attempted to take a coastal route they were repulsed at Maketū, sustaining a number of casualties. Te Aporotanga, an important Te Whakatōhea chief, was captured and later executed by the wife of a slain Te Arawa chief. Te Whakatōhea believed that their leader had been murdered by a pro-government iwi and that Governor Grey should have punished Te Arawa for this act. By late 1864 conditions in Ōpōtiki were grim. The fighting had disrupted food cultivation and outbreaks of typhoid and measles killed a quarter of the population. The arrival of a Pai Mārire mission led by Kereopa Te Rau and Pātara Raukatauri in February 1865 aggravated existing divisions among Te Whakatōhea. Völkner remained based in Ōpōtiki during the fighting, but visited Auckland in 1864 and again in January 1865. Several locals warned him not to return to Ōpōtiki because he was seen as a government spy. Letters he had written to Governor Grey in 1864 appeared to support these accusations. Völkner had also helped remove a popular Catholic missionary, Joseph Marie Garavel, accusing him of acting as a messenger for Waikato Māori. For his part, Garavel supported the claim that Völkner was a spy. Despite the warnings, Völkner returned to Ōpōtiki with fellow missionary Thomas Grace on 1 March 1865. Both were immediately taken prisoner. Grace was spared but witnessed the killing of Völkner the following morning. Völkner ‘knelt down and prayed, and, having shaken hands with his murderers said “I am ready”.’ After an hour his body was taken down and decapitated. Kereopa removed the eyes and swallowed them, describing one eyeball as Parliament and the other as the Queen and English law. Te Whakatōhea executed Völkner because after being welcomed into their tribe he had betrayed them to Grey. The man who placed the rope around his neck was Pokeno, the son of Te Aporotanga. Völkner’s killing was also an act of utu for the killing of Te Aporotanga, which Te Whakatōhea believed should have been dealt with by the government. The government responded to Völkner’s death with military reprisals. His killers were hunted down. A number of local people were arrested, and some executed. In addition a large area of land was confiscated from eastern Bay of Plenty tribes. Völkner's body was buried at his church, which was later reconsecrated and dedicated to St Stephen the Martyr. Kereopa Te Rau was found guilty of his murder and executed at Napier in 1872. As part of the settlement of Ngāti Rangiwewehi’s Treaty of Waitangi claim, in 2014 Kereopa was pardoned for his role in Völkner’s death. We have 1 event in history, 14 biographies, 3 articles, 1 comment related to Carl Völkner. TRIBUTE TO THE MEMORY OF THE REV. CARL SYLVIUS VOLKNER. might be for a time, resistance would ultimately lead to their discomfiture. connection with the North German Missionary Society. leave this fact to speak for itself. After tho horrible! the fanatics commenced their journoy southwards. The natives give two reasons for Mr. Volkner's murder. special reason is that tho Opotiki natives had been told that . Mr. Volkner reported to the Governor that they wore car- '. ryiog on a secret correspondence with the rebels, through ! ing. The general reason is this : that they attribute the . and tho missionaries used their influence to buy land for the Government ; and that from this cause the present war sprang. The fanatics declare, therefore, that they will murder all missionaries.